Obviously, a new computer will be faster than one you've owned for years. But here are six other reasons to buy a new PC that don't appear on a spec sheet. Intel, Microsoft, and others PC power players like to brag about how fast their computers are by drawing comparisons to “five-year-old PCs.” But does this obsession with performance miss a more important message? We think it does, and there are many more reasons to buy a modern PC than just raw speed. Interactivity, convenient security, ease of use—these are critical features that don’t appear on spec lists. Even a modern PC’s sheer portability may not be immediately apparent. If you have an old clunker of a PC and are considering a new one, here are six great reasons to open your wallet. Intel first developed the concept of a thin-and-light “ultrabook” in 2011, but it really wasn’t until five years ago that manufacturers really embraced it. Today, most premium consumer notebooks fall into the thin-and-light category, with products like Acer Swift 7Remove non-product link line emphasizing a thin, svelte form factor—just 0.35-inch thick and 2.54 pounds. Compare that to something like the Toshiba P845T-S4310 from several years ago: It’s over 4.5 pounds and an inch thick! 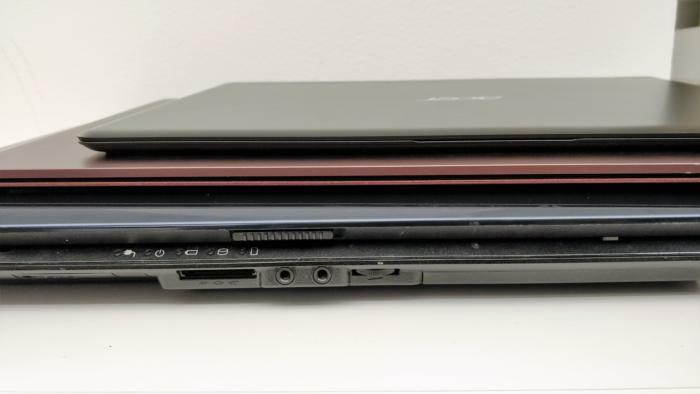 Compare the Acer Swift 7 (2018) on top, the Microsoft Surface Laptop (2017) in the middle, and the Toshiba Satellite A215-S5837 (2007) on the bottom. The Toshiba’s lid is thicker than a modern laptop! 2-in-1 tablets offer another option, where you can get the machine’s weight below 2 pounds by removing the optional keyboard. In fact, the Microsoft Surface Pro 6 comes in at 1.73 pounds. But whether you opt for a clamshell design with a non-detachable, hinged display; a convertible design with a display that can spin 360 degrees; or a 2-in-1 tablet with a removable keyboard, all of these modern PCs will be markedly thinner and lighter than their aging counterparts. And that improves quality of life. Old PCs are laden with a triple-whammy of technologies that slow down boot times: slow processors, poky hard drives, and a comprehensive shutdown/boot procedure. Shoot, you may as well grab a cup of coffee while your PC boots. But newer PCs use a technique called Fast Startup, which wakes your PC from a deep-sleep mode. In essence, your PC hibernates instead of entirely shutting down. 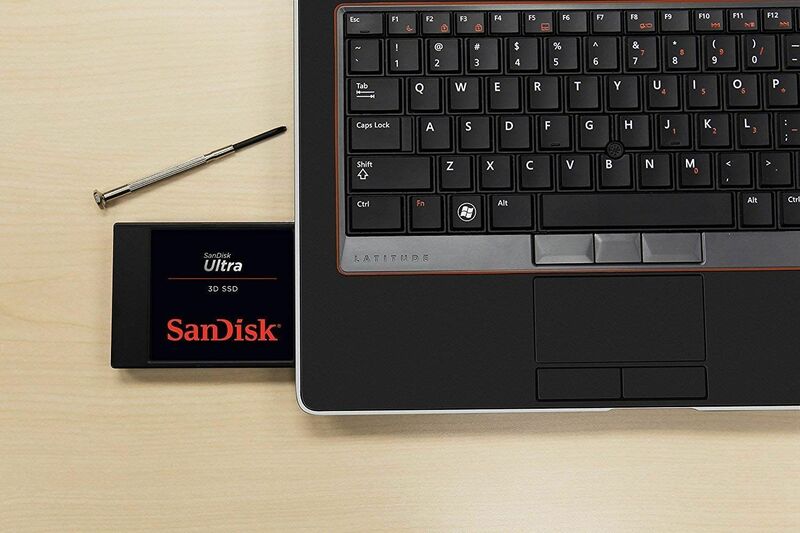 An SSD can be a powerful upgrade to an existing laptop, but they’re increasingly more common in new notebooks. Remember the great 1992 hacker movie, Sneakers? One of the plot points hinged on a biometric code with a character identifying himself by literally using “my voice is my password.” Windows Hello is that movie, made real. Instead of using your voice for security authentication, however, Windows Hello uses either a “depth camera” built into the front of your notebook or tablet, or a fingerprint reader that scans your fingerprint like many smartphones do. 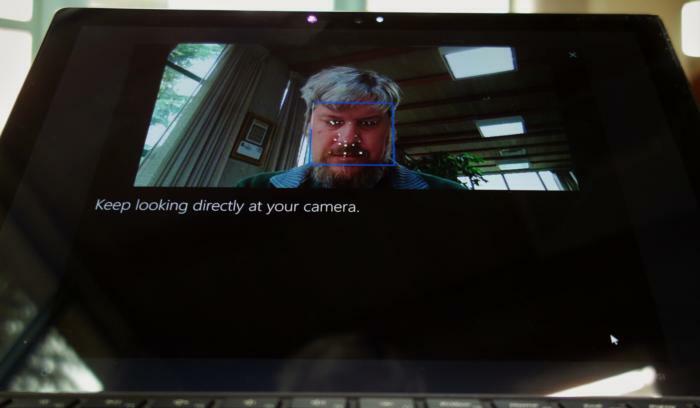 Windows Hello uses either a front-facing depth camera (shown here) or a fingerprint reader to recognize you. Here, the setup process maps your facial characteristic (fortunately ignoring windblown hair). With the latest notebooks, setting up Hello takes literally a second or two as the camera records your face within Windows. Fingerprint readers, conversely, take a bit more time to learn all the lines and whorls of your fingerprint. Neither authentication scheme is entirely perfect—a bushy beard will occasionally trip up the camera trying to recognize your face, and fingerprint scanners can get grimy. But nine times out of 10, “logging in” involves simply looking at the camera, and that’s it. One of the more overlooked motivations to buy a modern PC is that security continues to evolve over time. Microsoft continues to iterate Windows 10, applying patches to defeat the ever-evolving attacks by bad guys. Ransomware is particularly troublesome, attacking your files and folders, and “locking” them via encryption until you pay a ransom to make them usable again. Windows 10 includes a feature called “controlled folder access” to limit access to your documents and photos, and it allows you to recover data from OneDrive in case ransomware gets by your PC’s defenses. 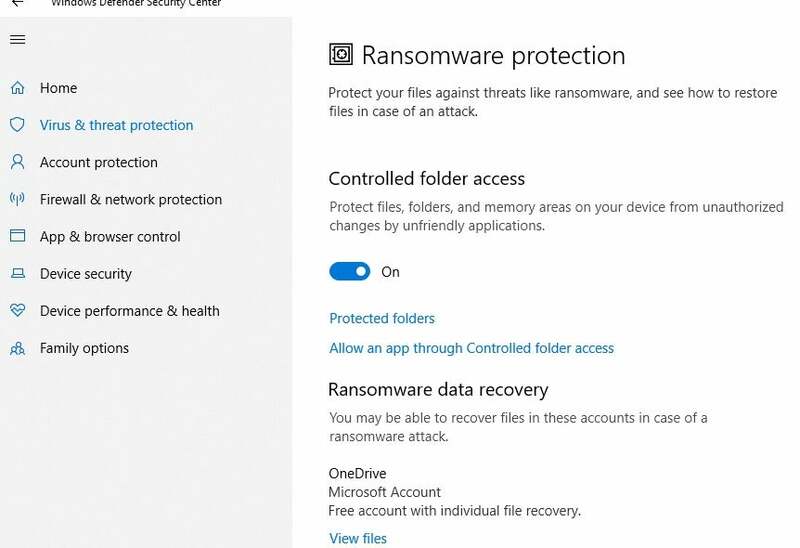 Windows 10 has built-in controlled folder access to limit app access to key files, and prevent them from being infected with malware. The other reason to buy a modern Windows 10 PC is simple: The clock is ticking on Windows 7. Specifically, in January 2020, support for Windows 7 Service Pack 1 will expire. You can learn more here, but the upshot is that if there’s a new vulnerability that Microsoft would normally patch... well, it won’t after the lifecycle ends. Relying on antivirus software and a well-patched browser may suffice after the lifecycle ends—or it may not. All it takes is one bad experience with malware, and security will be top of your mind forever. You might be able to get by without a mouse—keyboard shortcuts and the arrow keys might be enough to navigate—but let’s face it, you really wouldn’t want to. But what if you had other input methods in your arsenal? Modern Windows 10 PCs let you ink with a pen, and interact via touch, voice commands, and even eye tracking. Many of these are designed as assistive technologies for people who may not be able to type or control a mouse. But they also serve as handy conveniences for people who choose to use them. 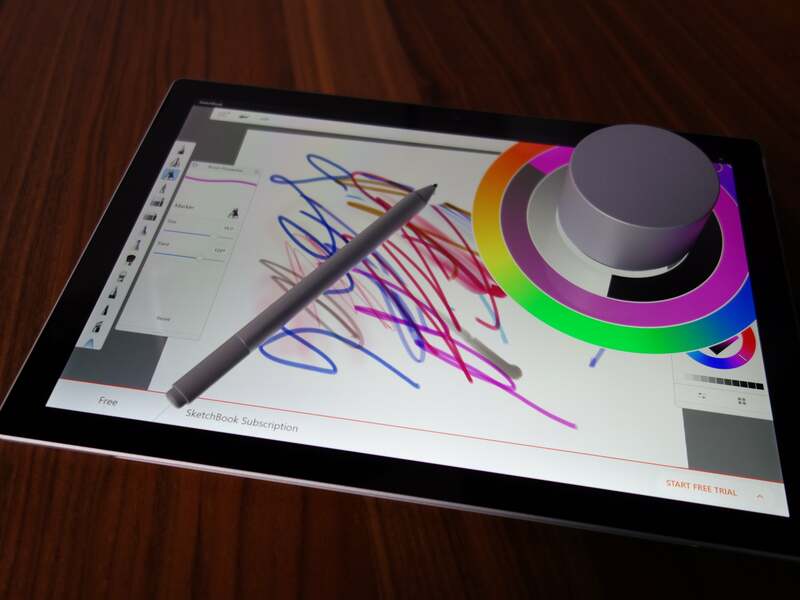 The combination of a tablet surface and digital stylus (as well as a specialized peripheral like the Surface Dial puck shown here) delivers an inking experience that an older PC can’t deliver. Take voice commands. You probably can’t perform the calculation “39 percent of 273” in your head, and even grabbing your phone and opening the calculator app is kind of a pain. But with voice commands enabled, you can ask Cortana for the answer in a flash. Of course, you’ll probably want to type your next presentation, rather than ink it. But a digital ink pen—included with many Windows tablets—serves as a handy alternative when your tablet is undocked. True “all-day” battery life sounds like hyperbole—until you actually get a chance to experience a laptop which seemingly refuses to run out of juice. But if you buy a modern PC, you’ll enjoy two battery benefits. Where would your laptop appear on this chart? Maybe it’s time for an upgrade. 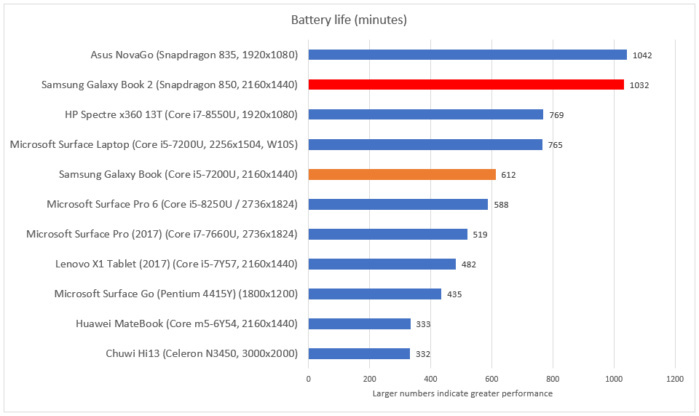 First, the batteries in older laptops simply aren’t as efficient as those in new machines. Worse still, a battery’s capacity diminishes over time. While there are ways to prolong its lifespan—don’t charge it to full capacity, and never let it completely run out of juice—the fact remains that its ability to hold a charge will gradually decrease, even to the point where it may simply refuse to charge at all. So why not start fresh, and with the best battery tech available? Second, the latest processors and chipsets found within modern PCs are designed to minimize power consumption, both in their architecture and process technology. Notebooks like the Samsung Galaxy Book 2, designed around a Qualcomm Snapdragon processor, return a real-world battery life of over 17 hours. That’s 6 AM until just before midnight, straight through. Obviously, the older your PC, the more likely it’s running power-hungry chips. Intel, partnering with Sharp and Innolux, is moving in a different direction: reducing the power of the display panel to about 1 watt. That’s going to push laptops like the new HP Spectre x360 13 to about 22 hours of rated battery life. Whether your notebook uses an Intel or Qualcomm chip, who benefits? You. All told, modern PCs simply offer many more options than older devices. 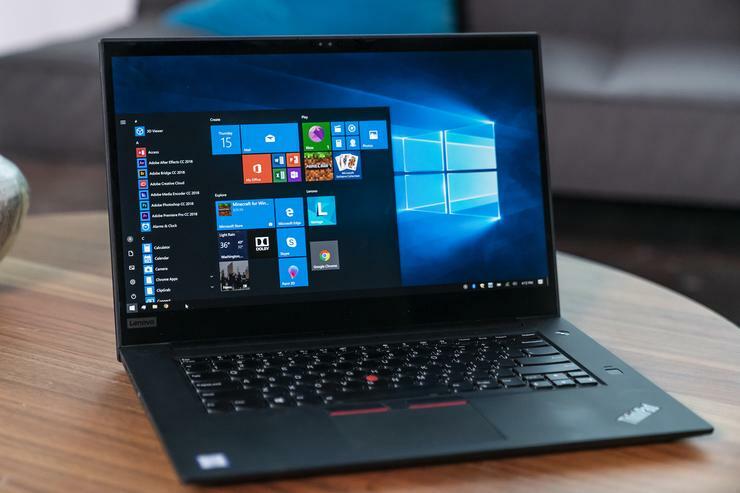 Yes, you’ll find our reviews talking about how fast the latest laptops are, but the bottom line remains simple: If you aren’t considering an upgrade to a modern PC, you’re missing out.